Let the experience of our tech experts help you with the most common, time-tested recommendations for using Sea Foam products in gas and diesel fuel systems, oil crankcases, and engine equipment fluid systems. 1) How much Sea Foam should I add to my fuel tank? By maintenance, we mean to maintain a healthy engine or when stabilizing stored fuel. Sea Foam’s maintenance recommendation for all fuel types is 1 oz per gallon poured into your tank. One pint treats up to 16 gallons. One gallon treats up to 128 gallons. When cleaning a gasoline or diesel fuel system, it’s safe to add more Sea Foam cleaning solvency to fuel. In fact, the more Sea Foam you add to fuel, the better it cleans! Start with a 2 ounce per gallon treatment and increase as needed. Ratios for induction cleaning devices can be as high as 50% Sea Foam to fuel. Sea Foam is made from highly-refined petroleum and cannot cause harm to an engine. Remember that Sea Foam in your tank at all times is always cleaning and lubricating the entire fuel system! When cleaning gasoline intakes, use in cooperation with Sea Foam Spray Top Engine Cleaner & Lube. 2) When should I use Sea Foam Motor Treatment in fuel? For Engines Used Regularly: By regularly, we mean engines that use and replenish fresh pump fuel every two weeks or sooner. For autos and trucks driven regularly, add one or two cans of Sea Foam to fuel every 2,000 to 5,000 drive miles. For engine equipment used regularly, add Sea Foam to a tank of fuel every 3 months or sooner. Add Sea Foam to every tank of fuel. Most engine manufacturers agree that unprotected fuel will degrade within 30 days. Sea Foam helps to clean and dissolve harmful residues and deposits from injectors, carburetors, intake valves and chambers. Sea Foam helps fuel to resist evaporation, prevents gum and varnish formation, and preserves ignition vapors. 3) What is your recommendation for adding Sea Foam to crankcase oil? Add 1 OUNCE to 1.5 OUNCES of Sea Foam Motor Treatment per oil quart for all 4-cycle gasoline and diesel engines. When ready, remove OIL FILLER CAP and pour the recommended amount of Sea Foam Motor Treatment directly into the engine crankcase. Do not exceed one treatment per oil change interval. Though Sea Foam can be added at any time between oil change intervals, we recommend adding Sea Foam to oil crankcases 100 to 300 drive miles before changing oil and filter. When checking dipstick, always change oil that goes from clear to dark. 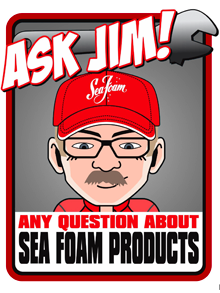 4) What should every first-time Sea Foam user know? WHAT EVERYONE SHOULD KNOW ABOUT SEA FOAM MOTOR TREATMENT. Sea Foam Motor Treatment only contains organic petroleum ingredients. It does NOT have harsh detergent or abrasive chemicals that can harm your engine or fuel system components. any make or type of Gasoline or Diesel Engine. all petroleum fuels whether Gasoline, Ethanol, or Diesel Fuel, including all blend variations. any type of engine crankcase using any variation of conventional or synthetic motor oil. 5) What are instructions to clean gasoline intakes with Sea Foam Spray? Use Sea Foam Spray to safely and effectively clean petroleum fuel and oil residues where fuel tank additives cannot reach. Sea Foam Spray delivers a high concentration of petroleum cleaning solvency to throttle bodies, intake runners, valves, pistons and chamber areas. Read Sea Foam Spray can for instructions and safety precautions. After hot soak period, start vehicle and road test for at least 5 minutes. Apply aggressive acceleration when possible and safe. >Best used with a cleaning dosage of Sea Foam Motor Treatment added to fuel tank. >Essential for Gasoline Direct Injection (GDI) systems where fuel and fuel tank treatments don’t wash over intake valves. >Depending on engine use, we recommend at least one Sea Foam Spray intake cleaning per year. 6) What are instructions to clean diesel injectors with Sea Foam? CLEANING DIESEL INJECTORS WITHOUT REMOVING PARTS. Run the engine to operating temperature, then shut off. Remove the primary fuel filter and drain the filter/filter housing. Though it’s not required, we recommend installing a new filter. Depending on filter type, fill entire filter or housing with straight Sea Foam Motor Treatment. Install the new filter (or reinstall a cleaner filter) while making sure there is no air in the filter or housing. With filter primed, start the engine and let it run for two minutes. Then shut off the engine. Allow five to fifteen minutes for the Sea Foam to soak into the deposit buildup. After the soak period, restart the engine and be prepared to drive/operate for 30 miles. Don’t be afraid to run it hard when possible and safe – An engine under load produces the necessary heat and compression for optimal cleaning. Sea Foam Motor Treatment is derived from petroleum-based ingredients and contains no harsh detergents or abrasive chemicals. What are your recommendations for storing 7) fuel and fogging engines? Adding Sea Foam Motor Treatment to stored tanks helps fuel resist evaporation, preserves ignition vapors, and prevents the formation of gum and varnish in fuel systems. Gum and varnish residues are the most common cause of poor engine function. Unprotected fuel exposed to oxygen will start to lose its freshness in less than 30 days. Immediately treat any fuel that may not be replenished within 30 days. For fuel storage up to two years, add 1 ounce of Sea Foam per gallon of fuel. Sea Foam Spray delivers a high concentration of petroleum lubrication to stored intakes, helping to protect top end parts and seals from wear, dry out, moisture intrusion, or any other cause of corrosion or deterioration. Apply Sea Foam Spray through throttle bodies and carburetor throats. Remove spark plugs after fogging intakes. When sprayed into cylinder cavities, Deep Creep coats and protects chambers/cylinders and piston components with petroleum lubrication. Deep Creep resists evaporation and creeps along metal surfaces for optimum coverage. Remember, Sea Foam and Deep Creep are made from highly-refined petroleum and cannot cause harm to an engine. Sea Foam in your tank at all times is always cleaning and lubricating the entire fuel system! 8) What happens if Sea Foam is combined with another fuel treatment? 1. Is it Safe to mix? 2. Will a mixture Harm my engine? Sea Foam engine products are blends of highly-refined ingredients derived from organic petroleum, so each shares the same hydrocarbon nature as gasoline fuel, diesel fuel, motor oil and other petroleum engine fluids. Most other additive products can be detergent/chemical-based, phenol-based, or alcohols. Because Sea Foam engine products share the same hydrocarbon nature as petroleum fuels and fluids, Sea Foam products won’t react to a chemical, detergent, or alcohol additive. Note: We do not promote intentional mixing of Sea Foam with other fuel and engine additives. 9) What is the best way to clean carburetors, bowls, and jets? CLEANING GUM AND VARNISH FROM CARBURETORS. Sea Foam Motor Treatment works in fuel to safely and effectively dissolve petroleum gum and varnish residues and deposits, helps to clear up carburetor passages and reclaim normal engine function. Sea Foam Spray works to deliver a high concentration of petroleum cleaning solvency to carburetor and injection intakes. When cleaning, remove tank fuel and drain the carburetor. Use fresh fuel whenever possible – Old fuel lacks “light ends” necessary for vapor formation during ignition. Add a cleaning dosage of Sea Foam Motor Treatment to fresh tank fuel. Start with 2 ounces per gallon of fuel, then add more if needed – The more Sea Foam you add to fuel, the better it cleans! If the engine does not run, crank engine or use primer to deliver new treated fuel into the carburetor, then allow Sea Foam to saturate and soak the bowl and jets for 24 hours. If the engine starts and runs, Sea Foam will work to dissolve residues as the treated fuel is drawn through the carburetor. Remember, Sea Foam and Sea Foam Spray are made from highly-refined petroleum and cannot cause harm to an engine. Sea Foam in your tank at all times is always cleaning and lubricating the entire fuel system! 10) Is it better to add Sea Foam to a partial tank? ADDING SEA FOAM MOTOR TREATMENT TO A PARTIAL TANK OF FUEL. 16 gallons of fuel amounts to 1 ounce of Sea Foam per gallon. 8 gallons amounts to 2 ounces per gallon. 4 gallons amounts to 4 ounces per gallon. 2 gallons amounts to 8 ounces per gallon. One gallon of fuel is 128 ounces. When it comes to cleaning dosages, none of the listed Sea Foam ratios is excessive though 2 ounces per gallon is often a sufficient starting point. Remember that more Sea Foam can be added to fuel when needed, and more fuel can always be added to a partial tank. If you’re adding Sea Foam Motor Treatment to fuel for the purpose of cleaning valves, carburetors, injectors, and chambers, adding more Sea Foam to a partial tank of fuel will offer a higher concentration of petroleum cleaning solvency than the same amount added to a full tank. So, when cleaning a gasoline or diesel fuel system, it’s safe to add as much Sea Foam cleaning solvency to fuel as you need. For overcoming driveability problems caused by residues and deposits (hard starts, stalls, hesitation, loss of power), you can start by adding a full pint of Sea Foam Motor Treatment to a partial tank of fuel. Adding when tank is low maximizes treatment concentration. 11) How much Trans Tune can I add to my transmission fluid? ADDING THE RIGHT AMOUNT OF TRANS TUNE TO TRANSMISSION FLUID. Unless the transmission contains an excessive amount of fluid, one pint (16 ounce can) is our recommended dosage amount when adding to auto transmission systems. Check your fluid amount before adding Trans Tune. Trans Tune can be used as a pre-flush cleaning treatment or as a conditioner for the life of the fluid. Add any time to smooth out rough shifting caused by varnish. Trans Tune only contains petroleum-based ingredients. It does not have harsh detergent or abrasive chemicals that can harm your transmission. Trans Tune will not change the viscosity of transmission fluid or harm seals, gaskets or o-rings. Trans Tune is compatible with all conventional and synthetic petroleum and mineral-based automatic transmission fluids. Do not use with silicone fluids or CVT systems. Treat fluid with Trans Tune one time per fluid interval. Trans Tune works quick to dissolve harmful deposits and control the moisture that impairs fluid system parts. When added to transmission fluid, Trans Tune works safely and quickly to smooth out shifting problems in transmissions caused by varnish formations and deposits. 12) Does Sea Foam have a shelf life? ANSWERING QUESTIONS ABOUT OLD CANS OF SEA FOAM. Sea Foam was trademarked in 1942. Even today we receive phone calls about unopened cans that were produced at some point during the last 75 years. Because Sea Foam Motor Treatment, Sea Foam Spray, Hydra Trans Tune, and Deep Creep are derived from organic petroleum, none of their contents will degrade in a sealed container that is not exposed to the oxygen atmosphere. No matter how old, Sea Foam does not have a shelf life if a container remains sealed. On containers that are opened and re-capped, Sea Foam will maintain much its cleaning and lubricating qualities for several years though there are always variables to consider. We at Sea Foam would not hesitate to use, anyway. Exclude occasions where the history of the container is not known.